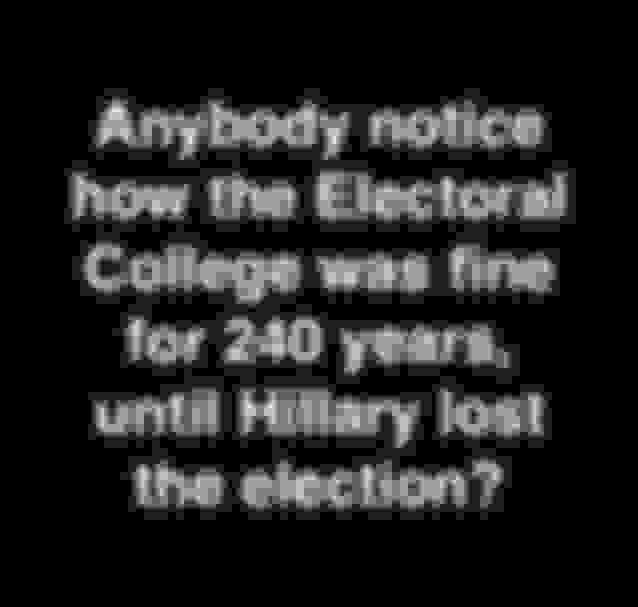 Recently in the news there has been discussion about getting rid of the Electoral College. Colorado is considering casting all of its electoral votes for the candidate that wins the nationwide popular vote in the next Presidential election. So my vote in New Jersey will count twice, once here and once in Colorado. Brilliant. Elizabeth Warren said that it would be good because it would encourage candidates to campaign in states that they don't today. For example, everyone knows that Massachusetts is going Democrat but if some votes could be gained by the Republican candidate, that would encourage the Republican to campaign in Massachusetts. Does she know that a couple of states already divide their electoral votes according to the popular vote in the state? Why isn't Massachusetts doing that? What she doesn't mention is that in a pure popular vote, any vote is as good as any other vote, so the candidates would only campaign in the highest density areas. Many states (and their voters) would be ignored. Nobody would campaign in Nebraska or any state near it. The entire midwest would get whatever the big cities (few states) wanted. Why waste your time with 2,000 people in a day in Des Moines when you can talk to 20,000 in Baltimore in the morning, then another 20,000 in Philadelphia in the afternoon? Make Kansas a big trash dump? Sure, say the people in the big coastal cities. Nuclear reactors lined up for miles in South Dakota? Great idea. Luckily, our Founding Fathers were way, way smarter than Elizabeth Warren. They came up with a way to find a balance for oh, about 230 years. Neither political party has had more than two consecutive Presidential terms in decades. Both parties do well at taking turns in power. So which party feels a need to complain? I don't see anyone today who has a better plan. I believe that this country is comprised of 50 states, each having as much power, autonomy, and authority as possible while remaining united. In Europe we feel that the usa is basically a 1 party state with two tendencies, comparable to North Korea. That's exactly what it is. Sometimes a decent candidate can sneak into one of parties but he will get ignored at best or usually slandered and ejected. Look at Patrick Little and Tulsi Gabbard. Why don't all states do that? 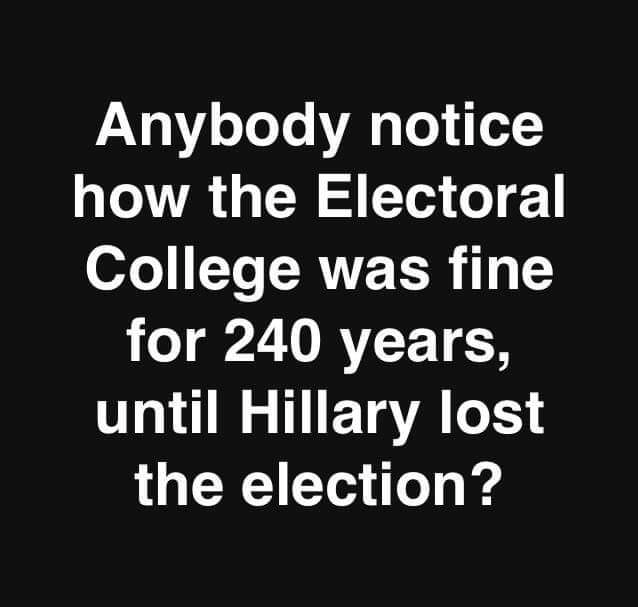 If they did, objections over the electoral college would probably be reduced quite a bit. No, they don't do well at taking turns in power, IMO. Governance has become, IMO, nothing more than massive power grabs every two and four years. When in power, ram thru as much of your agenda as you possibly can. When the power shifts, the other side tries to undo as much of that agenda as they possibly can. Repeat, repeat. The idea of melding differing views into policies and governance that everyone can live with has been abandoned. "Does she (Elizabeth Warren) know that a couple of states already divide their electoral votes according to the popular vote in the state? Why isn't Massachusetts doing that?" "Why don't all states do that? If they did, objections over the electoral college would probably be reduced quite a bit." That may be true, but then your question would be asked until all states split the electoral votes by party. Each state has its own election and just because one state does something one particular way, it does not mean that all must. This country is a union of 50 separate states with 50 separate Presidential elections, and they are weighted by population. It makes candidates consider carefully what they are going to say and where they are going to say it. It also makes it hard for anyone to tamper with the Presidential election because there are 50 of them. There is a security feature built in. Smart! Does anyone think that with a pure popular vote nobody will ever try to stuff the one and only "electronic ballet box"? If so, I would like to sell you a bridge in Brooklyn. It would be a hacker's Holy Grail. Many would try and if only one succeeded, the chaos that would ensue would be epic. No thanks. Changing the Electoral College isn't happening in my lifetime. It would take lots of people in lots of places to agree to a change. The states that would get screwed by a pure popular vote would have to agree to a change so it ain't happening. Not worth discussing. The more I think about what Colorado is considering, the dumber it gets. "No, they don't do well at taking turns in power, IMO. The idea of melding differing views into policies and governance that everyone can live with has been abandoned." We agree that the parties take turns as each has power for a term or two at a time. I made no claims on how they behave, which is generally poorly. I agree with what you said, but I don't think it's as new as some may believe. In the 1860's, things were so bad that Americans took up arms against each other with armies fighting all over the place. Does anyone see that happening in their neighborhood? Blue and gray armies lined up slaughtering each other in our back yards? No. Without each party pulling hard in opposite directions, how would we be able to identify the middle? As long it's just words, that's OK with me. Put all ideas out there for discussion. I believe that our system of government was designed to foster arguments as an alternative to allowing one powerful group to silence all others. Sure, we have jerks and ******** in government, but the more I try to learn and understand how our government was designed, the more I can't think of a better way nor have I heard of any. Our Founding Fathers were some pretty smart dudes. They put protections in place so that we may freely have these discussions. The structure is fine, we just need to get the jerks and ******** out. And maybe people expect too much from the government and should heed JFK's advice. "Not that problems and disagreements can't develop from having 50 autonomous states. But, overall, it's a good thing"
States do argue. Ohio "won" the battle for Toledo and as a consolation prize Michigan got the Upper Peninsula. I've been to Toledo. I think Michigan lost the battle and won the war. Who cares what Europeans think? As I recall we broke away from and later saved them. Being a Michigander, I wholeheartedly agree. Even if we hadn't gotten the beautiful UP, we got rid of Toledo. Let all voices be heard, even extreme ones. Let all interests be represented. May it ever be thus. This is fundamental. The problem with the jerks and ******** in government are those ignorant jerks and ******** that continuously vote them in term after term. That is why I am for term limits ...and no, 16 yr olds have no right voting for something they haven't even been taught about in school. Our government was not originally designed to have a year round employed Congress, they were only supposed to show up every couple of months to conduct the countries business, then go back to their lives in their states. The states were to govern themselves as independents, the federal government was to provide security for the states and work in conjunction with them when law bounded borders, but not participate in it. This aspect that our federal government is the go to source for how we conduct states business, has been totally misconstrued from poor teachings and people who simply fail to comprehend the Constitution itself. As for the electoral college, it was designed so populace states like NY and Calif can't rule dictatorially over smaller or less populace states. Thus creating a monarchy for which we declared our independence from. Talk about ignorant jerks and ******** electing the same jerks over and over, New Jersey is a case study on that and it works great for very few well connected people. The rest of us just pay the bill. I just don't know how we're going to get members of Congress to agree to term limits and put themselves out of work. As you said, our government was designed for people who have regular lives and jobs/businesses, but that's not what we have today. We have too many career politicians. I understand and somewhat agree with keeping turnover in check and having some continuity with people who know what's going on because some issues are complex, but nobody needs to be in Congress for decades. Term limits will be slow in coming. At best I see term limits for future members of Congress, not applying to present members. But Congress has little to no interest in addressing this. Saved us ? From what ? All the USA did was enrich themselves after only being a third world country in 1940 and and at an important cost of US lives. Not the USA, not the UK, not the USSR won anything, only the banks who financed wars won, and are still winning. Now Germany is the only country in the world with an economic excess, compare that to the trillions of US state debt. The USA went bankrupt in 1913 with the foundation of the Federal Reserve. The USA is one of the very few countries in the world that does NOT have its own money, every single dollar is borrowed from the Federal Reserve, which are four of five private banks lending money to the USA and getting a good interest on that money. The USA will NEVER be able to repay that and losing millions and millions on never-ending interests. Wow, we were a third world country back then? Serious though, don't make this a country measuring contest. This is about a US system of the electoral college. Lets not forget that the USA came in to support Europe late in the game and very reluctantly at that. The UK has only recently finished paying back the USA loan in today's adjusted values of £225 billion. Also do not forget that the UK has lost lives in supporting the US in its wars recently so go ahead and say "who cares about Europe" that indicates a true lack of understanding of reality. Sore losers and those ignorant to the process of a republic. Once properly informed, the attitude tends to change. People have been complaining about EVERYTHING for years, decades, and centuries, so that argument is not valid as proof of a new problem, or even a problem at all. This country has, in 240 years, been through: The War of 1812, slavery, the Civil War, the Spanish American War, assassinations of three Presidents, World War I, Prohibition and the gangster warfare that came with it, The Depression, World War II, the Korean War, the Vietnam War, Civil Rights issues, protests in the streets, White House scandals, The Gulf War, the Iraq War, the Kardashians, terrorist attacks, let's see, did I leave anything out? And through all that we still have the Electoral College. No previous generation saw fit to abolished it. So, tell me, what is going on today that is more serious than all that, that now we need to overhaul our system of electing a President and abolish the Electoral College? I'll avoid sarcasm here and just invite a logical answer to that question, which I know doesn't exist. I trust in the belief that our Founding Fathers were pretty smart. Unfortunately, many people today don't appreciate that, and worse, think they know better. And most don't have a clue, but they sure have an agenda. Last edited by stu46h; 03-21-2019 at 07:51 PM. England badly wanted (and needed) our help in World War I but we really didn't want to get involved. The sinking of the Lusitania by German submarines cost American lives and changed that. At the Treaty of Versailles negotiations at the end of the war, some of our European Allies felt that the USA didn't deserve an equal voice in the negotiations because we arrived late in the war. Interesting concept but did they consider that maybe, just maybe, the war ended BECAUSE we showed up? They were stuck in trench warfare, going nowhere until we arrived. Perhaps the breaking of the stalemate and our arrival were somehow related. It's like wondering if the driver of the tow truck had anything to do with your car getting pulled out of the mud because he was only there for the last 20 minutes of the 4 hours that you were there. Without the US coming in with fresh troops and equipment, the borders of Europe would certainly be different. Watch the movie (documentary actually) They Shall Not Grow Old, it was done by the director of Lord of the Rings, and rather well I must admit. The mind set of living in those horrid conditions for years on end were creating surrender and live with what it is mentality on both sides. This is a totally other subject though. I do have to say, if it weren't for Woodrow Wilson, there may not have been a WWII. He bantered for such harsh reparations on the Germans, it created Hitler. Wilson was a racist (he re-segregated the military) and was a deplorable progressive president. The point, though, is that complaints about EC are not purely the result of Clinton losing the election, as the posted meme asserts. You probably did , but your point is still well illustrated. In politics we ...the country as a whole, I mean.....rely much more on emotion than logic. Fear and anger are exploited. Manufactured outrage. Doomsday predictions. Creating boogeymen. The FFs were smart, indeed. Among their many wisdoms was giving us the ability to change things, via the legislative branch of government. Up to and including amending the constitution....which is an awesome responsibility that shouldn't be taken lightly. Well, every politician (and lobbyist, election committee, SuperPac, special interest groups, political pundit, etc) has an 'agenda'.